Warid Pakistan announces an amazing offer where on purchase of a new prepaid SIM, customers will be given 1500 free on-net minutes over a period of three months on a minimum recharge of Rs. 50 every month. This offer is valid for all new prepaid customers and port-in customers. How to Check your free minutes: Dial *200*7#. With the help of Warid Mobile Number Portability (MNP) service, non-Warid customers can also switch to Warid Telecom network to get the benefits of this amazing offer. Warid Telecom has established the credibility and transparency of its promotions by making communication not just simple and easy, but rewarding and worthwhile. Buy any new SIM (Glow, GEO or Warid Prepaid) and make free calls for 3 months. Get 1500 free minutes on a recharge as low as Rs 50 per month. Offer is valid for all new prepaid customers and also if you port your existing connection of any network to Warid. 1st Month recharge of Rs 50 will give 500 free minutes. 2nd Month recharge of Rs 50 will give 500 free minutes. 3rd Month recharge of Rs 50 will give 500 free minutes. 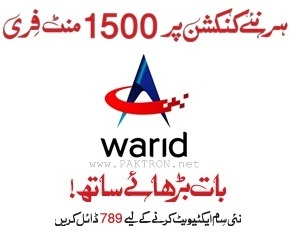 Free minutes can be used for Warid to Warid calls only. Validity of free minutes given every month is 3 days. Minimum recharge required is Rs 50 to avail free minutes. Free air time given on SIM activation would remain as before, free minutes after recharge would be an additional benefit. In case of package change, free minutes will still be usable. This offer is available for recharge through scratch card and Warid Ezeeload. It is not available through Warid balance share. Check your free minutes through *200*7#. This is a limited time offer and only for prepaid subscribers.